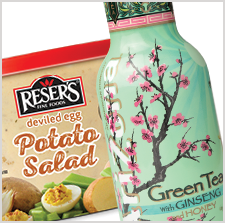 Inland Packaging has been recognized by TLMI with two Best of Class awards, one for the AriZona Green Tea Shrink Label and another for the Reser’s Deviled Egg Potato Salad injection in-mold label. The TLMI Annual Awards Competition aims to stimulate innovative printing and to recognize technical achievement in all areas of the narrow web industry. The competition recognizes and honors the finest efforts of converter members. Winners of the 40th annual Label Awards were recognized at the TLMI Annual Meeting held in Scottsdale, AZ. The AriZona Green Tea 9 color shrink sleeve label received a First Place Best of Class in the Roll to Roll category. The Reser’s injection in-mold label on a clear substrate was awarded First Place Best of Class in the Non-Pressure Sensitive – All Processes/Cut & Stack – Color Process – Prime category. For more information on TLMI visit their website.